WellcomeMD, a RIchmond-based "concierge" or "membership" medical practice, has become a financial supporter of our programs by becoming our first Encorepreneur Partner. The company's goal is to establish the kind of personal relationship with its patietnts that once prevailed between primary care pysicians and their patients while accessing new, cutting edge treatments. Both WellcomeMD's founder, Linda Nash, and its first RIchmond physician, Dr. Neal Carl, are former speakers at Encorepreneur! Breakfasts. The support provided our Partners will be used to bring new programs and projects to our attendees. For instance, the video's of our conversation with Abigail SPanberger was produced thanks to WellcomeMD's support. Newly elected Congresswoman Abigail Spanberger answered questions about her transition from CIA agent to business woman to candidate to Member of Congress at our January breakfast. She answered questions before record breaking crowd of 350 at the Cultural Arts Center of Glen Allen. More than 500 encorepreneurs requested spots for the event, but it was sold out in just a few hours. Rep. Spanberger talked about her journey from J.R. Tucker High School to the halls of Congress and about the steep learning curve from realizing she was a winner on Novemeber 6th to the floor of the House on January 3. And ,she shared some fun stories about how she told her mother-in-law she was a CIA agent, and how she completed her victory speech while her 4 year old daughter sat on her feet behind the podium. Nancy Eberhardt, a long-time encorepreneur and author of Uncommon Candor asked questions submitted in advance by the attendees. Jane Henderson has been named to the 39th class of Outstanding Women Awards honorees by YWCA Richmond. The list includes eight women who are leaders in the community in eight different categories, and Jane was named to the business category. Jane founded Virginia Community Capital, and is a board member and past president of Community Development Bankers Association, former board chair of Community Housing Partners Corporation and board member of Community Development Trust. 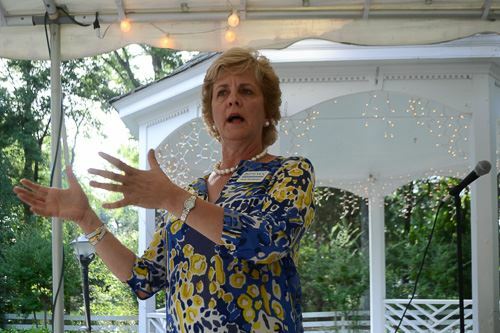 Jane spoke at the Virginia Cliffe Inn in Glen Allen, and shared the unique story of a "bank that gives back". Virginia COmmunity Capital, beginning with bipartisan funding from our state legislature almost 10 years ago, is growing a successful model for delivering capital to under-served markets. With a group of diverse partners and socially conscious investors, VCC is focused on creating healthy vibrant Virginia communities.